We often get the question — which solution is best for me: Portal API, Documents API or Gateway API? Here’s the whole truth about all of them and how they differ. What does it do? Portal API is meant for automating actions in document signing portal, it can be described as an extension to the portal. It basically means that you use our portal with all the features that it has but API allows you to make some of the actions automated. A document that needs to be signed by anyone can originate in any system and be simply sent to the Dokobit portal for signing. The originating system then receives a final document when the needed parties have signed it. The main advantage is that your originating system, website, document management or any information system does not have to worry about the signature part. Just send a prepared document to the API along with information about who needs to sign it and then wait for it to be returned. Who can benefit the most? 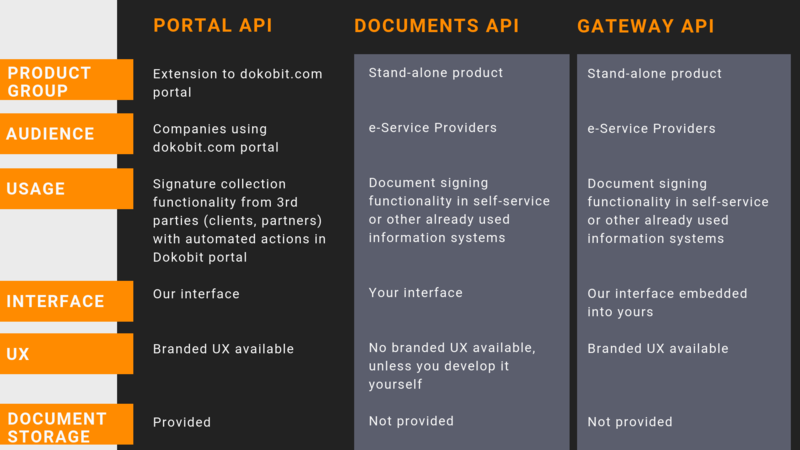 We recommend choosing Portal API for enterprises that want to use Dokobit portal as a tool to collect signatures from the third parties, e.g., clients or partners. We’d say it’s the most beneficial for those companies that already use Dokobit portal for signing documents with the clients but want to take it to the next level by automating processes. For example, with Portal API signed documents can automatically be placed in company’s document management system or elsewhere. What else does it provide? Portal API offers a branded customer experience, so when a document is sent to your clients or partners, they receive a letter with your company logo and colours. You also won’t have to worry about your own document storage — everything will be stored in Dokobit portal unless you choose to use your own storage after each signing process is completed. What does it do? Documents API is a stand-alone product for signing, archiving, timestamping and validating documents. It is similar to Portal API but the difference is that Documents API doesn’t offer any user interface, only the service that allows to sign, archive, timestamp and validate documents. Let’s put it this way — if the portal is an entire car, then Documents API is only an engine. This means that companies integrating this API are fully responsible for user experience and interface in their systems by themselves. If you are able to take care of things like previewing the document that should be signed, display signature information, etc. then the Documents API is a very powerful tool. The Documents API does not store any customer data so, for example, if 5 signees need to sign a document, it’s sent through the API 5 times while the signatures are processed and not stored. Who can benefit the most? 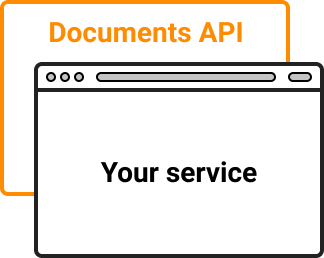 Documents API is best for e-Service Providers — SMEs, enterprises, Government — that want to have a document signing functionality in their self-service or other already used information systems. This API offers the most flexibility and customisation options, however, integration effort is slightly higher. What else does it provide? New legal frameworks require users to give approvals, consents or confirmations for various actions regarding their personal data. Often service providers need to keep some proof of the customers’ consents but find it unnecessary and too much to create and store a signed PDF document to be able to verify later that the user truly gave their permission for something. In this scenario, hash signing can be very useful, for example, to confirm a financial transaction. With hash signing, the signed data can easily be kept in any database in case it is needed later, instead of creating huge volumes of unnecessary PDF documents to solve the same problem. Also, with Documents API we offer pricing per transaction, so there are no hidden costs. As we see it, Documents API decreases all the barriers for organisations to switch to e-documents. In addition, Documents API provides a possibility to combine it with e-Identification API allowing users to authenticate themselves using Mobile ID, Smart-ID, eID or Estonian e-Residency cards. This way your users will be able to log in to the system and sign documents using the same tools, besides, authenticating users with e-signature ensures the highest security level, there will be no passwords or databases to hack or breach. What does it do? 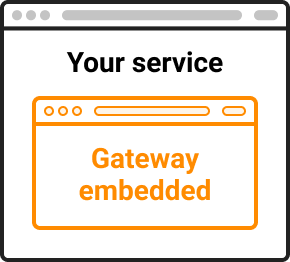 Gateway API is a stand-alone product, a full-featured web application which can be integrated into your own system. Simply put, it’s like a plugin — it can be embedded into your information system as an iFrame element or modal window. As Gateway has an already developed user interface, companies integrating this API don’t need to develop it from scratch but rather customise it, which makes it simpler and faster and requires lower integration expenses. Who can benefit the most? Gateway API is best for e-Service Providers — SMEs, enterprises, Government institutions — that want to have a document signing functionality in their self-service or other already used information systems. What else does it provide? It allows you to fully customise what Gateway looks like by applying custom styles using your own CSS. With custom CSS, the integration will look as an integral part of your own system to provide the best user experience for your users. Also, there is no need to think about how the document is previewed and other relevant information fetched for the signing part. It has already been taken care of. Just plug it into your service and you are ready to start signing documents. One more benefit is that the interface and messages can be set to the preferred language. The Gateway also offers things like sequential signing which is useful in cases when the same user needs to sign a few documents in a row. With Gateway API we offer pricing per transaction, so there are no hidden costs. Quick integration and all the other benefits make it a flexible product that has all the necessary functionalities for organisations.